One of the reasons I love seeing blogging communities in higher education is because it gives me a chance to see the collective intelligence of that community come together.Even after only a couple of weeks, there are blogs popping up on SB You nearly every day. We’ve not done any marketing and have really kept things quiet so far as we kick the tires and figure things out around here, so to see people playing along is really very cool. 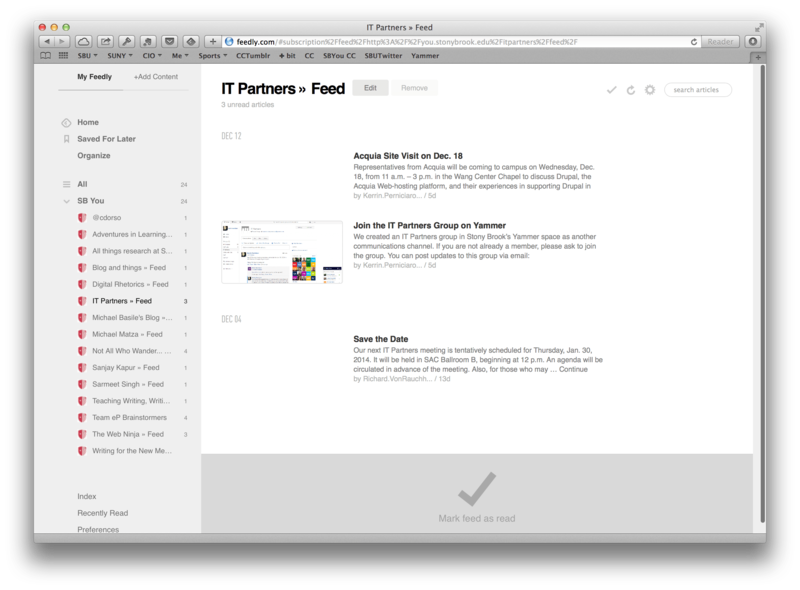 To keep up, I’ve created a new Feedly account and have been adding new SB You blogs as they are being created. The only thing I was I could do was share this SB You collection like you could back in the days Google Reader. I am already seeing this emerge as something very positive for the Stony Brook community in general. I can only imagine how interesting it will get as we move into the spring semester and faculty start using blogs in their classrooms! I always loved seeing what people at Penn State were doing with their university blogs and I know this will be the same kind of thing.